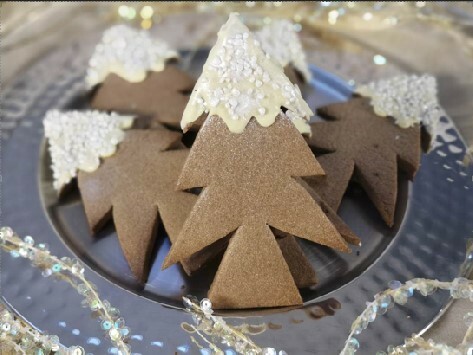 These easy ginger biscuits are perfect on their own but even better when used to decorated my Cacao Chocolate & Ginger Christmas Cake. Give them as a gift, cut and baked into any festive shape that takes your fancy. Beat butter and sugar until pale and creamy. A freestanding mixer makes this really easy. Add the egg and combine until one pale liquid mixture. Add the dry ingredients in one go and mix until a dough forms in the bowl. Wrap the biscuit dough in clingfilm and refrigerate for 15 minutes to allow the butter to firm up. Roll the dough out to around 5mm thickness on a lightly floured surface. 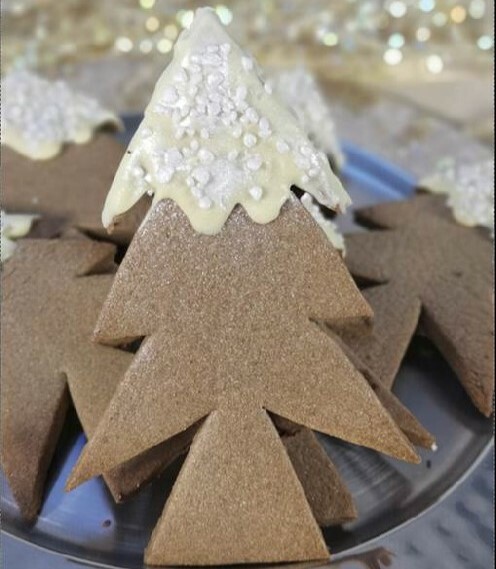 To make simple cookies, cut out festive shapes using cutters of your choosing then see step 6. To make freehand trees to decorate your cake, use a sharp knife to cut tree shapes of around 15cm in height and 10cm at their widest point. Be as creative as you like. You will need to bake 6 of these for your cake. Lay your cut biscuits on baking sheets lined with baking parchment and refrigerate again for another 15 minutes. This prevents the shapes from spreading out as they bake. Bake the biscuits for 10-15 minutes until golden and firm on top. Allow to cool completely before decorating with melted white cacao. Your decorated trees will adhere to the frosting around the sides of your covered cake.